Graphite gaskets are cut from pure graphite sheet or graphite sheet with metal reinforcement, features excellent corrosion-resistance, high-and-low temperature resistance, good compression resilient and high internsity it can be used as sealing elements of pipe, valve, pump, pressure vessel, heat exchanger and condenser, etc. 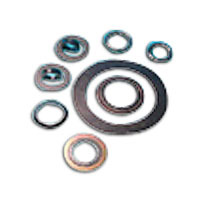 Other complex gaskets such as water gauge gasket and flange gasket with bolt holes are available. Wrapped with metallic stripe in the inner and outer circle borderline. Keep the former excellent performances. Can be installed and disassembled conveniently without damage. Application: Flanges, valve bonnets, heat exchangers, level indicatiors etc. Typical Service Fluids : High temperature & pressure steam, hot water, gases, heat midium, hydrocarbon, organic so;vents, acids, alkalis(PH0-14),LPG,LNG,liquefied oxgen, nitrogen and hydrogen etc.